Mini backpack for women featuring the Tommy Hilfiger women signature flag stripe and gold TH hardware. Exterior front pocket with gold zipper hardware. Top zip closure with top handle. Adjustable straps with gold hardware detail. Lined nylon interior with wall zip pocket and slip pocket. 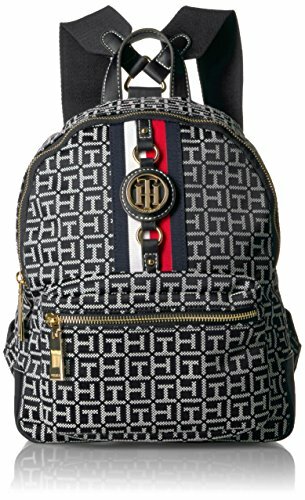 This Tommy Hilfiger backpack purse is a versatile essential, the perfect mini backpack for work or play. Our stylish women's backpack will keep you organized while on the go. 9-3/4" length; 12-1/2" height; 5" width; 1-3/4" drop.